The Smith chart was created by Phillip H. Smith in 1939. It’s a graphical tool designed for electrical engineers specializing in radio frequency (RF) to solve problems related to transmission lines and matching circuits. Use of the Smith chart has grown over the years and it’s still used today, not only as a problem solving tool, but as a graphical display to show how RF parameters behave at one or more frequencies. 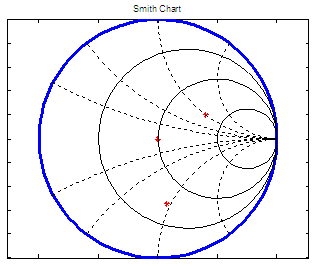 Normalized scaling allows the Smith chart to be used for problems involving any characteristic or system impedance which is represented by the center point of the chart. The most commonly used normalization impedance is 50 ohms. Once an answer is obtained through the graphical method, it is easy to convert between the normalized impedance and the corresponding unnormalized value by multiplying by the characteristic impedance. Reflection coefficients can be read directly from the chart. Use of the Smith chart and the meaning of the results obtained requires a good understanding of AC circuits and transmission line theory, both of which are needed by RF engineers. In the chart, there are horizontal circles that represent constant resistances; vertical circles represent constant reactances. The complex impedance (or admittance )is normalized using a reference, which usually is the characteristic impedance Z0. The chart is part of current CAD tools and modern measurement equipments. It’s a graphic of the reflection coefficient in polar coordinates. Let’s create a chart with Matlab. Now, let’s prepare some formulas to calculate typical values used in RF theory. To plot a reflection coefficient we need a normalized impedance with magnitude and angle. It’s a good idea to deliver the angle in degrees to make it easier to visualize, and also let’s calculate the Voltage Standing Wave Ratio (VSWR) and the return loss. % Calculate VSWR and return loss.